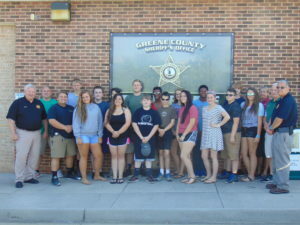 The Greene County Sheriff’s Office holds a youth academy each year. This is a FREE program that is designed to provide the youths in our communities the opportunity to gain insight into the everyday functions and training of the variety of law enforcement agencies and emergency services in our government. It is a program offered to students who have an interest in law enforcement. The daily curriculum includes physical training, hands on learning, demonstrations from specialized units such as the SWAT Team, K-9, Investigative Unit, Fire, Rescue, Search and Rescue, Park Rangers and others. The cadets also get the experience of class trips to agencies that include the Criminal Justice Training Academy, and Correctional Facilities to name a few. The dates for the 2018 Youth Academy are June 4, 2018 – June 8, 2018. Participants will be trained in First Aid/CPR, educated on weapon safety, crime scene investigation, court procedures, and many other law enforcement training topics. They will take tours of the Central Virginia Regional Jail and the Criminal Justice Academy. Applications are available for pick-up at your school’s administrative office. Applications must be turned in to the Sheriff’s Office by May 21, 2018.